During this open studio time, we will come together to connect in circle, demo gel plate printmaking, then will have free time to play with art materials. 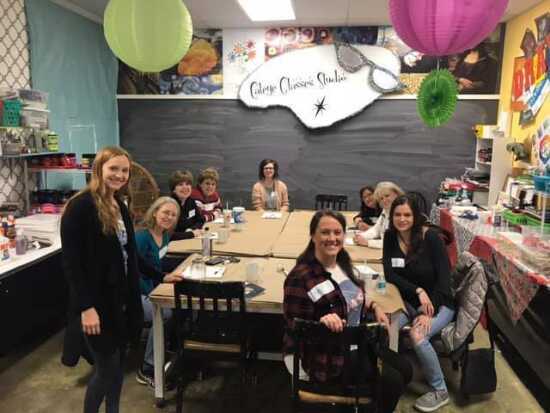 This is your chance to nurture your creative soul, connect with other women, and make that art project that you've been putting off! You go to the gym because you know you'll work out if you are there. You come to the art studio because you know you'll create there! coffee & hot tea, small amounts of paint, markers, scrapbooking paper, stencils, stamps, yarn, other mixed media supplies, basic tools like paint brushes & scissors, and loads of inspiration! watercolor/mixed media paper, art journal, canvas, paint for larger projects, gesso/ paint medium, beads, air dry clay, wood slices to paint, fabric to paint/stamp/stencil, embroidery hoop, rocks/leaves/sticks to paint or wrap with yarn, supplies that are gathering dust at your house, any other materials you want to play with!